Karen Adams’ firm, Green Dwellings makes modular, sustainable homes. 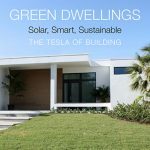 Karen Adams founded Palm Beach Gardens-based Green Dwellings to create a modular, solar, LEED Platinum-certified, hurricane-resistant home for south Florida. View feature in Florida Trend Magazine, click here.